More than 100 members of the New York Chapters of the Media Communications Association-International (MCA-I) and the National Academy of Television Arts & Sciences (NATAS) joined forces on September 23 to launch their 2002-2003 membership drives and programs. It was the first time the two groups had come together to network and discuss their roles in media production. 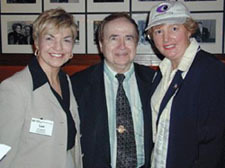 Event producer Lee Spinelli, TV broadcaster and our host for the evening, Joe Franklin, and NY chapter president Emma Justice. Event organizers Lee Spinelli and Emma Justice from MCA-I and Greg Kimmelman, Bob Shewchuck, and Bill Hanauer from NYNATAS spent months planning the evening’s activities, which took place at Joe Franklin’s Memory Lane Restaurant. 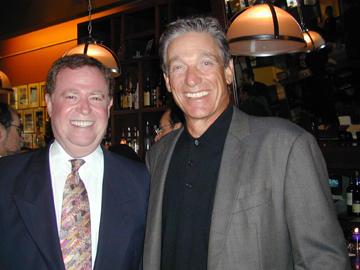 Among the attendees were Maury Povich, noted television host and president of the New York NATAS chapter, and Joe Franklin, talk show icon and restaurateur, who is soon to be inducted into the NATAS Silver Circle, which honors outstanding lifetime achievement in broadcasting. Greg Kimmelman, NATAS Membership Chair, and Maury Povich, TV talk show host and president of NATAS, enjoy the networking hour. Members of both organizations took advantage of the opportunity to make new acquaintances and renew longtime contacts. The Decibelles provided lively entertainment. Promoting Member Programs Sign-up tables for both organizations welcomed new and returning members withinformation about upcoming events. MCA-I’s year-long series of programs offers business and production information on a wide variety of topics. “These seminars provide our members with professional and instructional information they can use to get more business, make their productions better and deliver more persuasive presentations,” noted Gary Kahn, NY MCA-I Program Chairperson. Topics for the year include the use of music to build an emotional connection in a production, several business-related themes on successful business planning, and technical programs on editing, the Internet, special effects and more. For a complete schedule of MCA-I events, see sidebar. MCA-I members could also see the variety of programs NATAS makes available to its members. Bill Hanauer, Executive Director of NYNATAS, invited everyone present to check into the depth of activities available.” We do more than the Emmys. The Emmy is our brand. Everyone recognizes the Emmy without necessarily understanding what it represents. It stands for what we do every single day to encourage better television. You are the future of better television. I invite you to become part of all that.” A complete calendar of NATAS events is available at www.nyemmys.org. Entertainment Rounding out the evening’s activities were numerous raffle drawings and a performance by Donna Coney Island’s four-part female a cappella group, The Decibelles. 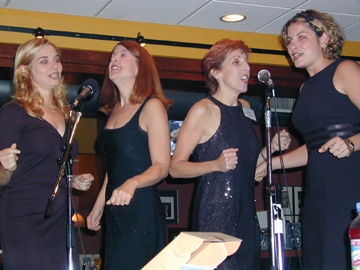 Donna, an MCA-I member, led the quartet in a medley of songs that crossed several musical eras from Big Band and Doo Wop to more recent ballads. Carol Rugh is a freelance writer from Monroe, CT, with over 25 years of experience in all aspects of corporate communications. She can be reached at rcerinc1@earthlink.net.